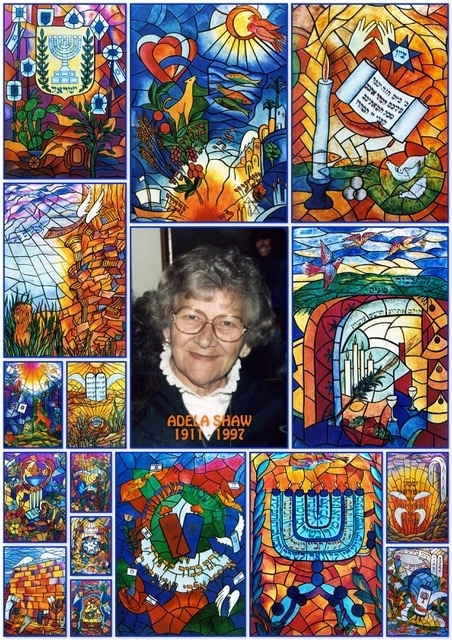 Our Shule's beautiful stained glass windows, depicting various Jewish Festivals and themes were lovingly created and generously donated by Mrs. Adela Shaw, ob'm. Adela’s children Michael Shaw and Betty Borkowski always knew that to Adela, the windows were a labour of love in that she gave birth to them because they took nine months to complete. It is not uncommon to see people on any given Shabbat or Yom Tov looking up for long periods of time admiring these magnificent windows and the mesmerizing colorful reflections dancing on the wall when the sun shines through them! We will forever be grateful for this legacy she has left us. Click to view photos of some of Adela's windows.